The South Pacific Eco-Xtreme sends you hiking into primitive areas few have dared to go. 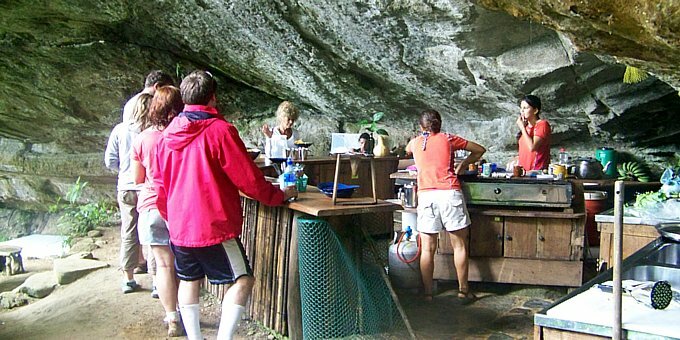 You’ll spend one night in an open cave behind a waterfall complete with cooked meals. 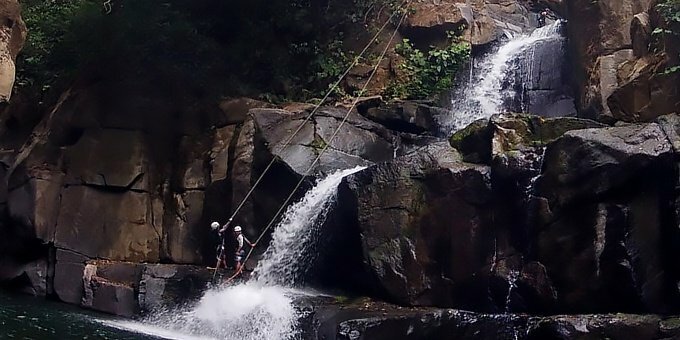 Besides endurance hiking through a remote jungle full of wildlife, you’ll be rappelling down waterfalls, shooting whitewater rapids, horseback riding, and exploring a remote beach area. 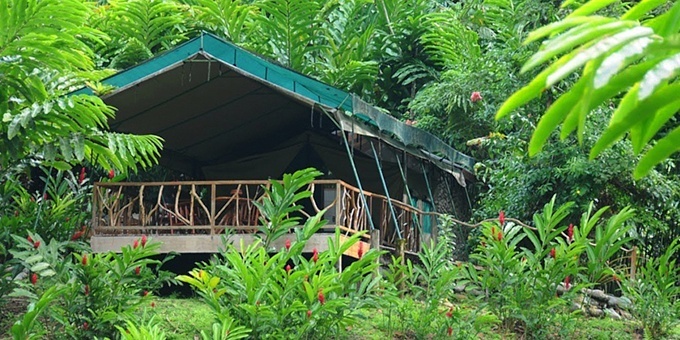 You’ll stay in a variety of eco-lodges and one hotel. 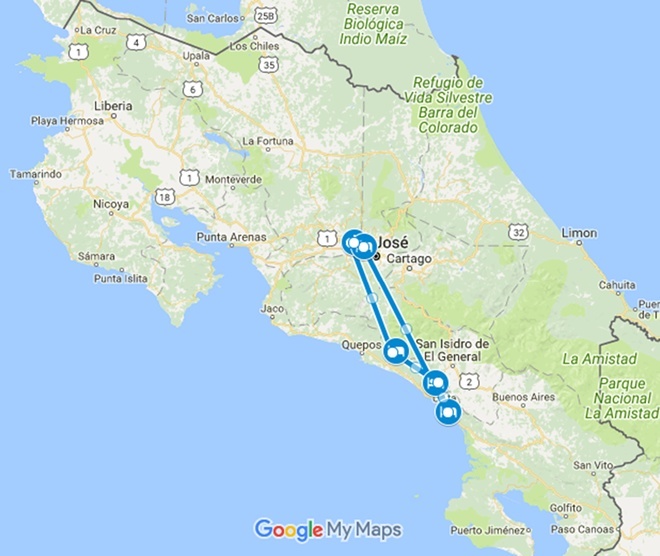 This adventure will take you into some of the wildest places in Costa Rica for an epic eco-experience words simply cannot describe! 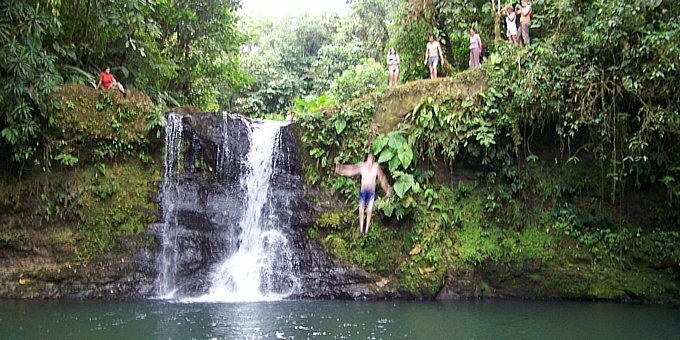 The South Pacific Eco-Xtreme will have you hiking up mountains into remote areas filled with waterfalls and jungle animals. 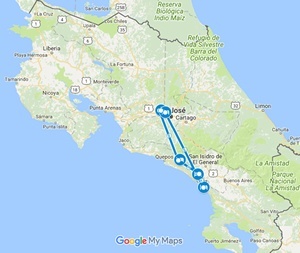 You’ll stay in incredible places including a luxury tent camp, a cave tucked behind a waterfall, and a secluded Pacific coast ecolodge surrounded by jungle with a trail down to a beautiful beach. 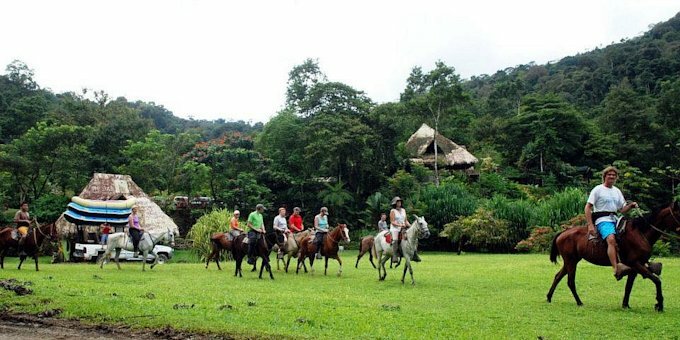 You’ll go waterfall rappelling, whitewater rafting, and horseback riding while on this amazing off the beaten path adventure taking you into the pristine wilderness areas of Costa Rica. Because it requires some endurance, it’s not for everybody, but for those who dare to fully immerse themselves in jungle life, it can be the vacation experience of a lifetime. Can you picture yourself on this amazing vacation? Inquire Now! We’ll be waiting for your arrival at San Jose International Airport. After a brief meet and greet, we’ll provide a private transfer through scenic mountains that reach down the South Pacific coast forming the Savegre River Basin. Your first few nights you’ll stay deep in the jungle at the Rafiki Safari Lodge glamping in a luxury safari tent totally surrounded by the sights and sounds of the rainforest, alive with wildlife nestled within a private 843-acre nature reserve. Due to its abundant wildlife and pristine waters, the Savegre River Basin was designated by UNESCO as an important natural biosphere giving it protected status. During the day you’ll explore the remarkable beauty of this remote area by horseback and go for a thrilling rafting adventure down the Rio Savegre’s Class ll and lll rapids. Back at the lodge, guests can enjoy a number of onsite hiking trails, cool off at the waterslide, or relax in the solar-powered hot tub. After a few days at Rafiki, we’ll provide a transfer that will take you into the Talamanca Mountains near Platanillo where you will meet your local guides for your next awesome adventure. 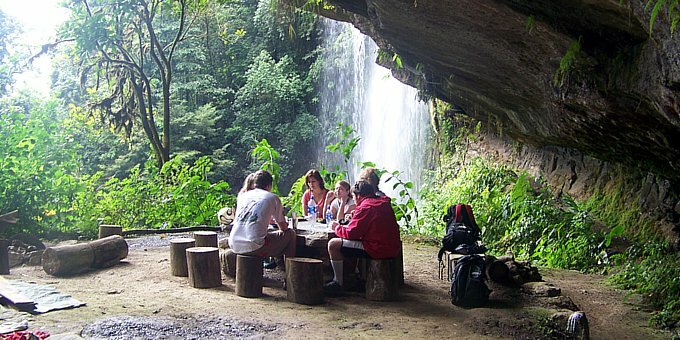 They’ll lead you on a difficult and at times muddy hike into the mountainous rainforest. After a couple of hours, you’ll reach an opening in the forest where you’ll see a spectacular waterfall. Tucked behind that waterfall is a cave with a rustic but functional kitchen and sleeping area with mats. This is where you’ll sleep tonight! 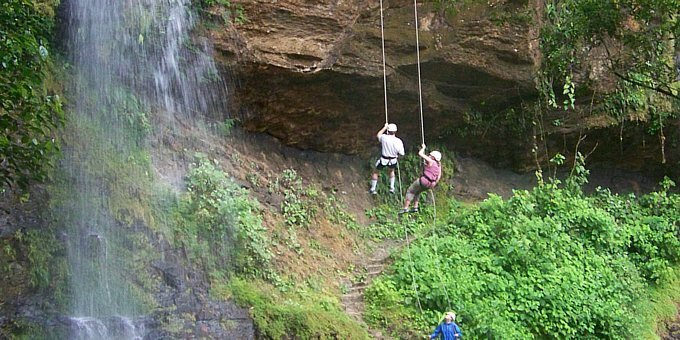 After settling in, your guide will get you ready to go rappelling down the waterfall in front of the cave (yes, you read that right)! Afterward, you’ll kick back and relax over dinner and be lulled to sleep by the sound of the falls. The next morning after breakfast, you’ll hike a little further up the mountain to another beautiful waterfall cascading into a large pool. Here it is deep enough for you to jump from the top of the falls and swim in the inviting waters below. After a while, your group will hike back down the mountain and meet up with your driver. This time your transfer will bring you through the mountains and down the beautiful South Pacific coast to La Cusinga Ecolodge. Along the dramatic shoreline, towering jungle-covered mountains meet the incoming ocean tides. Surrounded by lush jungle, the lodge rests on a cliff with spectacular views overlooking the Pacific coast with its sandy beaches divided by rocky outcroppings. There are no scheduled activities over the next couple of days. We’d recommend exploring the lodge’s private reserve complete with natural river pools, or hiking down the trail to Arco Beach. Supporting abundant wildlife, this remote area also provides excellent birdwatching opportunities. The lodge offers an onsite wellness spa and yoga classes, so there is no shortage of things to do while you are there. Of course, you can also simply relax and do nothing as well! The Aracari Restaurant serves breakfast, lunch, and dinner. After a few rejuvenating days at La Cusinga, we’ll provide a transfer back to the Central Valley where you’ll stay at the Country Inn and Suites. This is an airport hotel but retains pure Costa Rican charm. 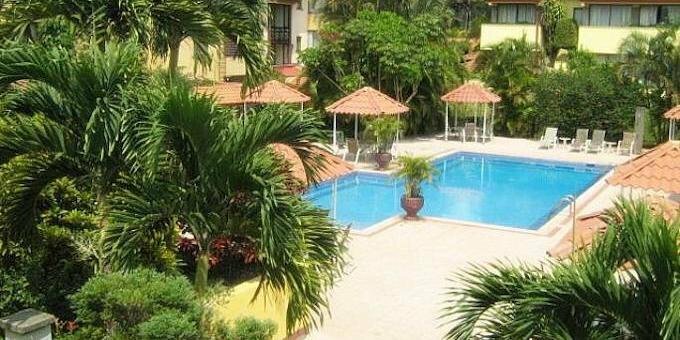 The hotel surrounds a central courtyard with pool, lounge area, and tropical gardens where you can relax and enjoy your last evening in Costa Rica. The next day, we’ll provide a private transfer back to the airport for your flight home. We’ll meet you at Juan Santamaria International Airport in San Jose (SJO) and provide a private transfer to the Savegre River Basin. You’ll be luxury camping at the Rafiki Safari Lodge. A local guide will lead you through the rainforest on horseback along the Savegre River and rural backroads. Back at the lodge you may like to explore the onsite hiking trails, waterslide or solar hot tub. 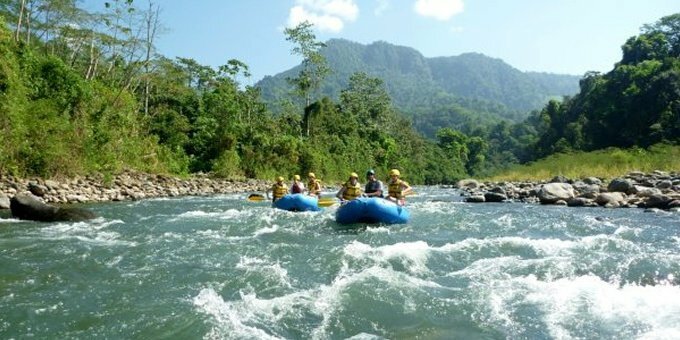 You’ll go on a thrilling whitewater rafting adventure down the protected Savegre River over Class II and III rapids. This trip, within a private reserve, hits parts of the river other companies cannot access and is sure to provide a memorable experience. A transfer through the Talamanca Mountains will bring you to the Platanillo area where you’ll connect with your guides who will take you for a long hike into the jungle. You’ll come to a waterfall with a cave tucked behind it complete with rustic kitchen and sleeping mats. You’ll spend tonight in the cave! After dropping your gear, your guides will help you take turns rappelling down the waterfall! Afterward you’ll be served dinner and in the morning you’ll have breakfast. Today you’ll hike to another beautiful waterfall where you can jump from the top of the falls into a natural pool below for a refreshing swim. After a while, you’ll hike out of the rainforest where your driver will meet you then take you to a remote area down the South Pacific coast. 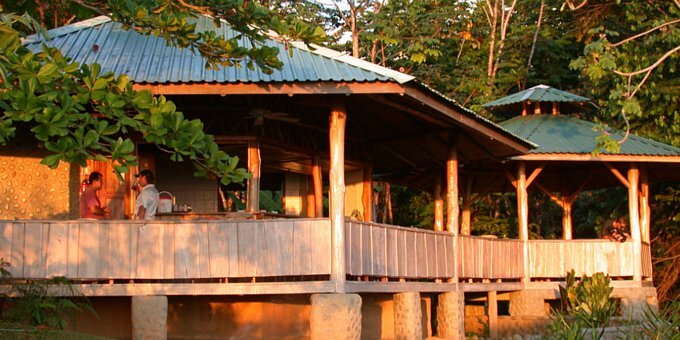 You’ll be staying at the La Cusinga Ecolodge high on a cliff overlooking the ocean with hiking trails, natural river pools, an onsite spa, and yoga classes. These days are intentionally left open for you to have time to relax and enjoy La Cusinga’s private nature reserve. The reserve is loaded with wildlife including monkeys, sloths, toucans, parrots, dart frogs, and a lot more. A trail from the lodge leads down to Arco Beach, which is simply gorgeous. We’ll provide a transfer back to the Central Valley, where you’ll stay at the Country Inn and Suites. This airport hotel is built around a central courtyard featuring a swimming pool, lounge area, and tropical gardens. 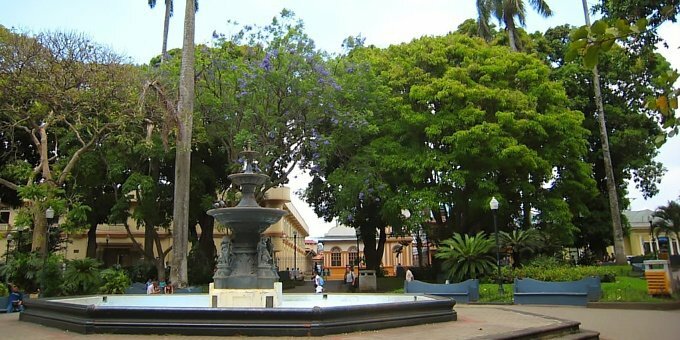 Here you can enjoy your last evening in Costa Rica with modern amenities! We’ll provide a private transfer back to the San Jose Airport according to your schedule so you can catch your flight home. The Savegre River winds down the Talamanca Mountains and out to sea, but before it gets there it passes through the enchanting valley of the Savegre River Basin nestled between cloud-shrouded mountains. This beautiful rainforested area has been designated by UNESCO as an important biosphere due to its pristine condition and abundant wildlife. 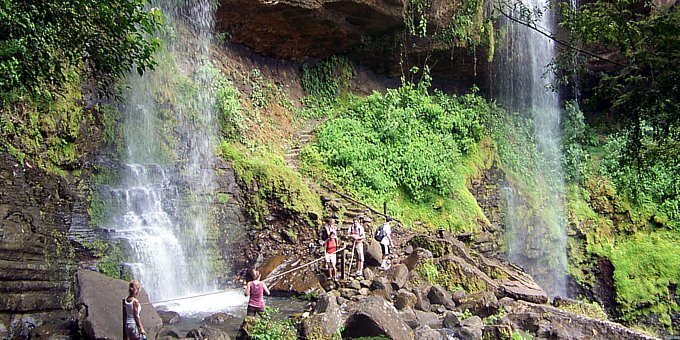 Its grandeur is intoxicating, surrounding you with verdant green, cascading waterfalls, and spectacular natural scenery. Near the quiet village of Platanillo, the jungle-covered Talamanca Mountains rise high into the clouds. These mountains remain mostly untouched, with towering trees, remote waterfalls, and exotic wildlife. 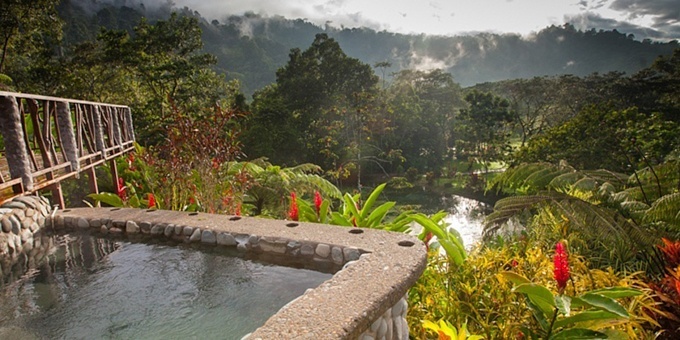 This sets the stage for your visit to a unique Costa Rican wilderness area few have ventured into or ever seen. Round trip transportation from listed tours (when reserved as stated). Low Season 2018 rates start at $1,553 USD* per person double occupancy, $1,373 USD* pp for triple occupancy, or $2,293 USD* pp for single occupancy for the lodges listed above. High season 2019 rates start at $1,691 USD* per person double occupancy, $1,469 USD* pp for triple occupancy, or $2,652 USD* pp for single occupancy for the same lodges. Low Season 2019 rates start at $1,590 USD* per person double occupancy, $1,402 USD* pp for triple occupancy, or $2,451 USD* pp for single occupancy for the same lodges. You can upgrade or downgrade hotels to match your preferences and budget. *Your vacation will be 100% customized to your needs. After inquiring with us, you will receive an exact price based on your custom itinerary. Please include special requests in the comments section. The rates listed here include current taxes, hotels, tours and transfers as described unless otherwise indicated. Rates may vary based on your travel dates, room occupancy, and type of transportation selected. Green season pricing and offers listed above are for select travel dates only and restrictions may apply. Inquire for details. Prices are subject to change at any time and do NOT include international airfare, travel insurance or any other services that are not expressly mentioned. Please provide your phone number – a 10-minute phone call is often more helpful than several emails.